Many-to-many (M2M) relationships in CTP 2.4 are based on M2M relationships in Power BI described here. M2M relationships in CTP 2.4 do not work with composite models. They allow relationships between tables where both columns are non-unique. A relationship can be defined between a dimension and fact table at a granularity higher than the key column of the dimension. This avoids having to normalize dimension tables and can improve the user experience because the resulting model has a smaller number of tables with logically grouped columns. For example, if Budget is defined at the Product Category level, it is not necessary to normalize the Product dimension into separate tables; one at the granularity of Product and the other at the granularity of Product Category. Many-to-many relationships are currently engine-only features. SSDT support will come before SQL Server 2019 general availability. In the meantime, you can use the fantastic open-source community tool Tabular Editor to create many-to-many relationships. Alternatively, you can use SSAS programming and scripting interfaces such as TOM and TMSL. To use many-to-many relationships, existing models must be upgraded to the 1470 compatibility level. 1470 models cannot be deployed to SQL Server 2017 or earlier or downgraded to lower compatibility levels. The memory settings described here are already available in Azure Analysis Services. 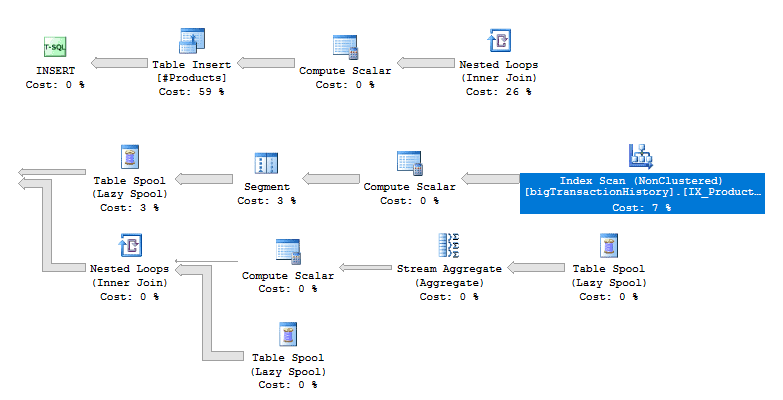 With CTP 2.4, they are now also supported by SQL Server 2019 Analysis Services. The Memory\QueryMemoryLimit property can be used to limit memory spools built by DAX queries submitted to the model. Changing this property can be useful in controlling expensive queries that result in significant materialization. If the spooled memory for a query hits the limit, the query is cancelled and an error is returned, reducing the impact on other concurrent users of the system. Currently, MDX queries are not affected. It does not account for other general memory allocations used by the query. The settable value of 1 to 100 is a percentage. Above that, it’s in bytes. The default value of 0 means not specified and no limit is applied. 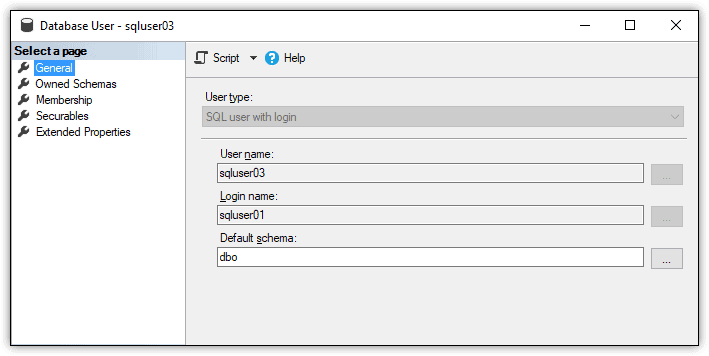 You can set this property by using the latest version of SQL Server Management Studio (SSMS), in the Server Properties dialog box. See the Server Memory Properties article for more information. The DbpropMsmdRequestMemoryLimit XMLA property can be used to override the Memory\QueryMemoryLimit server property value for a connection. The unit of measure is in kilobytes. See the Connection String Properties article for more information. The OLAP\Query\RowsetSerializationLimit server property limits the number of rows returned in a rowset to clients. This property, set in the Server Properties dialog box in the latest version of SSMS, applies to both DAX and MDX. It can be used to protect server resources from extensive data export usage. Queries submitted to the server that would exceed the limit are cancelled and an error is returned. The default value is -1, meaning no limit is applied. To get started with SQL Server 2019 CTP 2.4, find download instructions on the SQL Server 2019 web page. Enjoy! We find great pleasure in announcing the public CTP 2.3 of SQL Server 2019 Analysis Services. New features detailed here are planned to ship later in Power BI Premium and Azure Analysis Services. Here is a question for seasoned BI professionals: what is the most powerful feature of SSAS multidimensional? Many would say the ability to define calculated members, typically using scoped cell assignments. Calculated members in multidimensional enable complex calculations by reusing calculation logic. Unfortunately, Analysis Services tabular doesn’t have equivalent functionality. Correction: it does now!!! As you can see, this can easily explode the number of measures. If a model has 100 base measures and each requires 10 time-intelligence representations, the model ends up with 1,000 measures in total (100*10). This creates the following problems. Calculation groups address these issues. They are presented to end-users as a table with a single column. Each value in the column represents a reusable calculation that can be applied to any of the measures where it makes sense. The reusable calculations are called calculation items. By reducing the number of measures, calculation groups present an uncluttered user interface to end users. They are an elegant way to manage DAX business logic. Users simply select calculation groups in the field list to view the calculations in Power BI visuals. There is no need for the end user or modeler to create separate measures. Consider the following calculation group example. 'Time Intelligence'[Time Calculation] = "MTD"
'Time Intelligence'[Time Calculation] = "QTD"
'Time Intelligence'[Time Calculation] = "YTD"
'Time Intelligence'[Time Calculation] = "PY"
Here is a DAX query and output. The output shows the calculations applied. For example, QTD for March 2012 is the sum of January, February and March 2012. Some of the calculation items refer to other ones in the same calculation group. This is called “sideways recursion”. For example, YOY% (shown below for easy reference) refers to 2 other calculation items, but they are evaluated separately using different calculate statements. Other types of recursion are not supported (see below). The YTD argument to the CALCULATE() function overrides the filter context to reuse the logic already defined in the YTD calculation item. It is not possible to apply both PY and YTD in a single evaluation. Calculation groups are only applied if a single calculation item from the calculation group is in filter context. This is illustrated by the following query and output. 'Time Intelligence'[Time Calculation] = "PY" || 'Time Intelligence'[Time Calculation] = "YTD"
A calculation group should be designed so that each calculation item within it presented to the end user only makes sense to be applied one at a time. If there is a business requirement to allow the end user to apply more than one calculation item at a time, multiple calculation groups should be used with different precedence. In the same model as the time-intelligence example above, the following calculation group also exists. It contains average calculations that are independent of traditional time intelligence in that they don’t change the date filter context; they just apply average calculations within it. In this example, a daily average calculation is defined. It is common in oil-and-gas applications to use calculations such as “barrels of oil per day”. Other common business examples include “store sales average” in the retail industry. Whilst such calculations are calculated independently of time-intelligence calculations, there may well be a requirement to combine them. For example, the end-user might want to see “YTD barrels of oil per day” to view the daily-oil rate from the beginning of the year to the current date. In this scenario, precedence should be set for calculation items. Here is a DAX query and output. 'Averages'[Average Calculation] = "No Average"
'Averages'[Average Calculation] = "Daily Average"
The following table shows how the March 2012 values are calculated. For easy reference, here is the definition of the YTD calculation item. It is applied with Precedence of 20. Here is Daily Average. It is applied with Precedence of 10. Since the precedence of the Time Intelligence calculation group is higher than the Averages one, it is applied as broadly as possible. The YTD Daily Average calculation applies YTD to both the numerator and the denominator (count of days) of the daily average calculation. The following new DAX functions have been introduced to work with calculation groups. Returns a reference to the measure currently in context. Returns a string containing the name of the measure currently in context. Returns a Boolean indicating whether the measure currently in context is one of those specified as an argument. SELECTEMEASURENAME() or ISSELECTEDMEASURE() can be used to conditionally apply calculation items depending on the measure in context. For example, it probably doesn’t make sense to calculate the daily average of a ratio measure. ISSELECTEDMEASURE() has the advantage of working with formula fix up, so measure-name changes are reflected automatically. Calculation groups work with query scope measures, but not inline DAX calculations. This is shown by the following query. Power BI implicit measures are created when the end user drags columns onto visuals to view aggregated values without creating an explicit measure. At time of writing, Power BI generates DAX for implicit measures written as inline DAX calculations. This means implicit measures don’t work with calculation groups. To reserve the right to introduce this at a later date, a new model property visible in TOM has been introduced called DiscourageImplicitMeasures. In the current version, it must be set to true to create calculation groups. When set to true, Power BI Desktop in Live Connect mode disables creation of implicit measures. The following Dynamic Management Views (DMV) have been introduced for calculation groups. Object-level security (OLS) defined on calculation group tables is not supported in the current release. They can be defined on other tables in the same model. If a calculation item refers to an OLS-secured object, it will return a generic error on evaluation. This is the planned behavior for SSAS 2019. We plan to introduce the following items in a forthcoming SQL Server 2019 CTP. MDX query support with calculation groups. RLS is not supported in CTP 2.3. The planned behavior for SSAS 2019 is that you will be able to define RLS on tables in the same model, but not on calculation groups themselves (directly or indirectly). Dynamic format strings. Calculation groups increase the need for dynamic format strings. For example, the YOY% calculation item needs to be displayed as a percentage, while the others should probably inherit the data type of the measure currently in context. We plan to introduce dynamic format strings in an upcoming SQL Server 2019 CTP. ALLSELECTED DAX function support with calculation groups. Detail rows support with calculation groups. CTP 2.3 of SSAS is still an early build of SSAS 2019. It being released for testing and feedback purposes only, and should not be used by customers in production environments. This applies to models with or without calculation groups. To use the new features, existing models must be upgraded to the 1470 compatibility level. 1470 models cannot be deployed to SQL Server 2017 or earlier or downgraded to lower compatibility levels. Calculated members in multidimensional are a little more flexible and enable a few scenarios beyond calculation groups, but they come at the cost of added complexity. We feel calculation groups in tabular provide a great deal of the benefits, with significantly less complexity. Calculation groups can only have a single calculation-item column, whereas multidimensional allows multiple hierarchies with calculated members in a single utility dimension. A DAX filter on a column value implicitly filters the other columns in the same table to the values of that row. Without introducing new semantics and complexity, multiple calculation-item columns in a single table would filter each other implicitly, so are disallowed. If you have a requirement to apply multiple calculation items at a time, use separate calculation groups and the Precedence property shown above. MDX supports recursion although there are known performance limitations. Quite often the same query results can be achieved using MDX set-based calculations instead of recursion. The right-hand side of MDX-script cell assignments to calculated members created by the Business Intelligence Wizard for multidimensional include a reference to the real member from the attribute hierarchy. This is required to safeguard against recursion. Since DAX doesn’t support recursion, so we don’t need to worry about this for calculation groups. The complexity bar is kept lower. If we ever decide to support recursive DAX in the future, we could perhaps introduce an advanced property to indicate that a DAX object is enabled for recursion, and only then require such safeguards to be in place. Multidimensional allows creation of calculated members on attribute hierarchies that are not part of utility dimensions. For example, a Northwest Region member can be added to the State hierarchy to aggregate Washington, Oregon and Idaho. This is useful for custom-grouping scenarios but can increase the likelihood of solve-order issues. Calculation items cannot be added to other column types. This keeps semantic definitions simpler. As we enhance calculation groups in the future – for example, if we introduce query-scoped calculation groups – we will take care to learn from the solve-order lessons of the past and strive for consistent behaviors. Calculation groups and many-to-many relationships are currently engine-only features. SSDT support will come before SQL Server 2019 general availability. In the meantime, you can use the fantastic open-source community tool Tabular Editor to author calculation groups. Alternatively, you can use SSAS programming and scripting interfaces such as TOM and TMSL. We think you will agree the AS engine team has been on a tear lately. This is the same team that recently delivered, or is currently working on, the following breakthrough features for Power BI. Calculation groups is yet another monumental feature delivered in a relatively short period of time. It demonstrates Microsoft’s continued commitment to enterprise BI customers. To try SQL Server 2019 CTP 2.3, find download instructions on the SQL Server 2019 web page. Enjoy! The 16th cumulative update release for SQL Server 2014 SP2 is now available for download at the Microsoft Downloads site. Please note that registration is no longer required to download Cumulative updates. The 2nd cumulative update release for SQL Server 2014 SP3 is now available for download at the Microsoft Downloads site. Please note that registration is no longer required to download Cumulative updates. In 2005 and 2012, Microsoft introduced a number of windowing functions in SQL Server, like my favourite function LAG. These functions perform well, but, in my opinion, the main benefit is making complicated queries easier to write. I’ve been fascinated by these functions for years, but there is one thing about them that has bothered me, and that is the performance of window aggregate functions. Luckily, that is changing with SQL Server 2019. What are Window Aggregate Functions? I’m running SQL Server 2019 CTP 2.2, and the database is in 2016 compatibility mode. The first query lists the sales orders, and the second query also has a sub total for each customer. The results should look like Figure 1. I think you would have to agree that calculating the subtotal was easy to do. You just have to add the OVER clause. 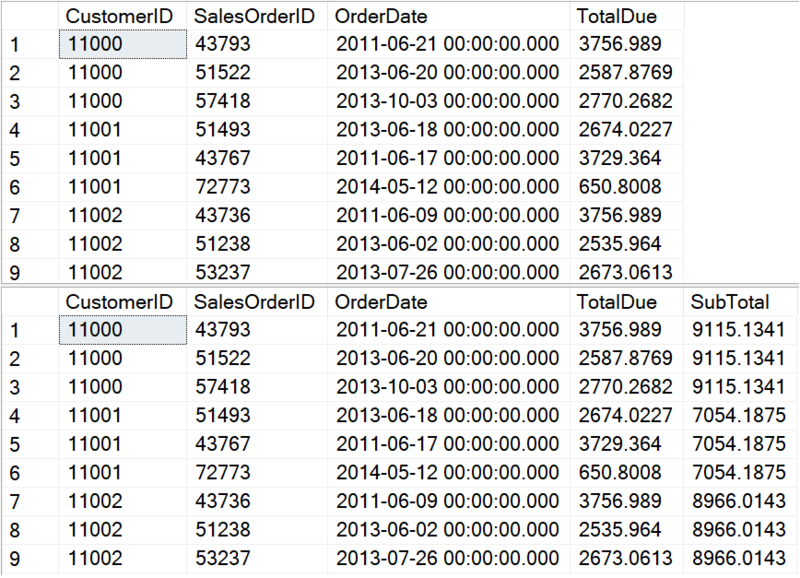 In this case, I wanted the subtotals for each customer, so I included PARTITION BY CustomerID. The problem with this technique is that the performance has been disappointing. In fact, I’ve been recommending that window aggregates be avoided when they must operate on a large number of rows. To show what I mean, take a look at the STATISTICS IO results in Figure 2. The first query has 0 logical reads for a worktable and 689 logical reads for scanning the entire table since there is no WHERE clause. 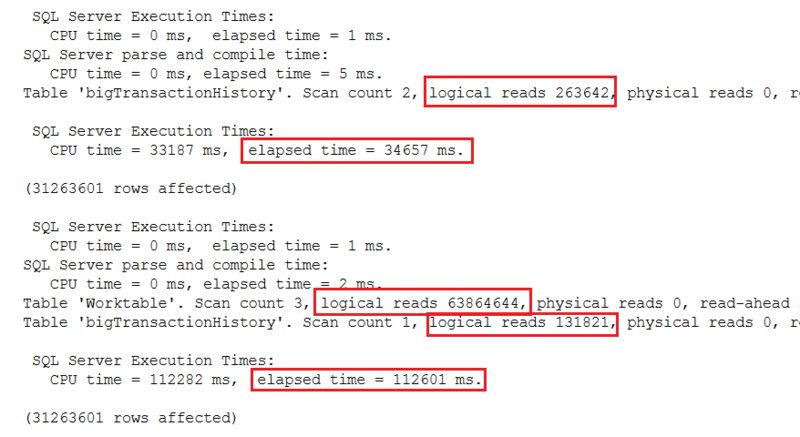 The second query also takes 689 logical reads for scanning the table, and 139,407 logical reads for a worktable. 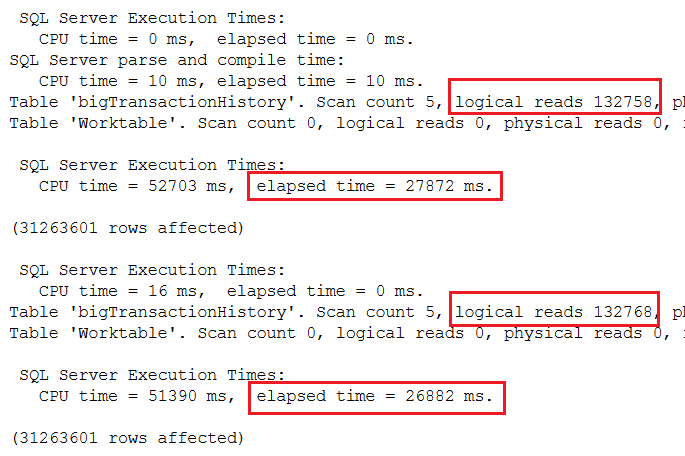 That’s a big difference, but do the logical reads for a worktable affect query run times? These AdventureWorks tables are too small to see the performance impact, but it does make a difference as you’ll see in the next section. 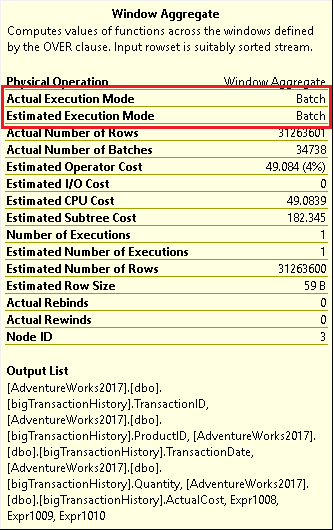 To show how much the window aggregate impacts performance, the following queries use bigger tables created from Adam Mechanic’s script Thinking Big Adventure. To make sure that populating SSMS (SQL Server Management Studio) does not affect the run times, the results are saved in temp tables. Here are two queries calculating the subtotal for each product in this table of 31 million rows. Since the results are stored in temp tables, the only output is the STATISTICS IO and STATISTICS TIME. The first query in this example demonstrates one of the traditional methods to get subtotals, using a CTE (common table expression) that joins to the original table. The second query creates the same results, but with a window aggregate function. To make sure that caching didn’t affect the run time, I ran the queries twice. The statistics results of the second run can be seen in Figure 3. The first thing to notice is that the traditional method took 35 seconds. The window aggregate function method took 156 seconds or about 2.2 minutes. You can also see a big difference in the logical reads. The traditional method took twice as many logical reads when scanning the table. That’s because the table was accessed once inside the CTE and again in the outer query. The table was scanned just once when using the window aggregate, but again, the logical reads required is much higher than just reading the table due to the worktable. As you can see, there is a big performance hit with window aggregates over traditional methods. In 2016, Microsoft announced an advancement in the columnstore index feature called batch mode processing. This feature also improves the performance of window aggregate queries as long as a table with a columnstore index is part of the query. If that happens naturally, wonderful! Otherwise, artificially adding a columnstore index seems like more trouble than just using the traditional query method. To show the difference in performance, this example creates an empty temp table with a columnstore index and adds it to the query. To see the benefits of the 2016 change, the database compatibility level was changed to 2016. The empty table #CS was created along with a columnstore index. It’s added to the query with an OUTER APPLY and doesn’t affect the results. In this test, the performance was similar to the traditional CTE query. That’s great, but in my opinion the main reason to use the window aggregate is to make the query simple to write. I don’t want to add the complexity of adding an artificial columnstore index. Luckily, in 2019, batch row processing applies to some queries that could benefit from it without a columnstore index, including window aggregates! This feature is called Batch Mode on Rowstore. Here is another test, this time with 2019 compatibility level. This time, the query took just 15 seconds to run! The performance results are shown in Figure 5. To get running totals, all you have to do is add ORDER BY to the OVER clause to the window aggregate. This is easy to do and will give you the results you expect as long as the columns in the ORDER BY option of the OVER clause are unique. To drastically improve performance, you need to add the frame (ROWS BETWEEN UNBOUND PROCEEDING AND CURRENT ROW) to the OVER clause. This is intuitive and is probably left out more often than it’s included. To see the difference, this test compares using the frame to not using the frame in 2016 compatibility mode. The results when using 2016 compatibility mode can be seen in Figure 6. By using the frame, the query went from almost 4 minutes to 1.4 minutes. Here’s the same test except for 2019 compatibility to take advantage of batch mode processing. With batch mode, there is no performance penalty due to leaving out the frame. In each case, it took less than 30 seconds to run, even faster than using the frame in 2016. Of course, you will need to include the frame if you need one that is different than the default. 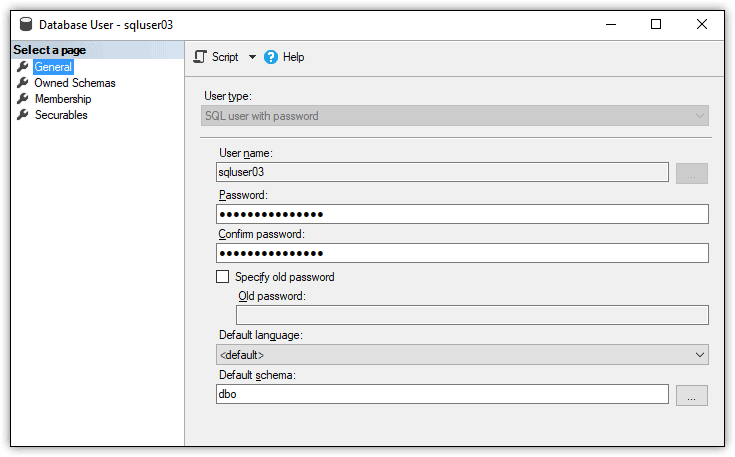 (See my article Introduction to T-SQL Window Functions to learn more.) Figure 7 has the performance results. As you can see, this new batch mode on rowstore feature dramatically improved the performance of these two window function queries. My queries ran about 7 times faster, but your results will vary. How does batch mode work? It breaks the processing down into chunks of 900 values. SQL Server reserves this for queries with aggregation and sorts when scanning a large number of rows. It’s one of several query processing improvements available with 2019 which together are called Intelligent Query Processing. You may be wondering how to know if batch processing is used for a query. If you take a look at the execution plan, you can see the difference. Figure 8 is the execution plan for the subtotal query while in 2016 compatibility mode. To make this easier to see, I’ve split the image into two. The top shows the left side of the plan, and the bottom is the right side of the plan. The first interesting thing to note is that parallelism is not used even though it seems like it would be useful in a query of 31 million rows. It might be possible to rewrite the query to persuade the optimizer to parallelize the query, but that’s an article for another day. Also notice the Table Spool operators. These are the worktables that you saw in the STATISTICS IO output. These are joined to the results using Nested Loops. If you open the properties of the Index Scan operator (Figure 9), you’ll see that the storage is Rowstore, and the Actual Execution Mode is Row. 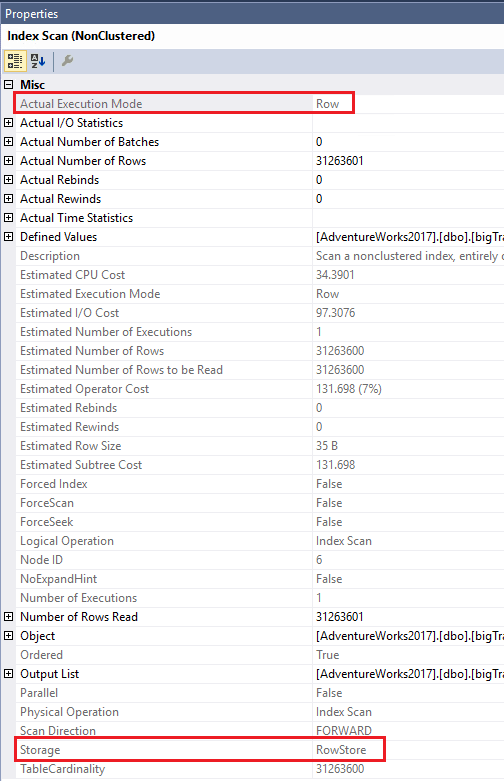 Now take a look at the execution plan in Figure 10 for the same query when in 2019 compatibility mode. Again, I have split it up to make it easier to read. First, you will probably notice that this plan looks much simpler. There are no more worktables (Table Spools) and no need for the Nested Loops. There is also the new Window Aggregate operator. Hovering over the operator brings up the information shown in Figure 11. You can see that batch mode was used. By looking at the properties of the Index Scan in Figure 12, you will see that batch mode was used even though the index is stored in rowstore and not in columnstore. As mentioned earlier, batch mode on rowstore is reserved for queries of a large size that include certain aspects such as sorting or aggregates. I wondered where the tipping point was for this query, so I decide to create a copy of the bigTransactionHistory with the same indexes, just a smaller number of random rows. I found that the tipping point was 131,072 rows for this query on this instance running in an Azure VM. It could be something entirely different for another situation. 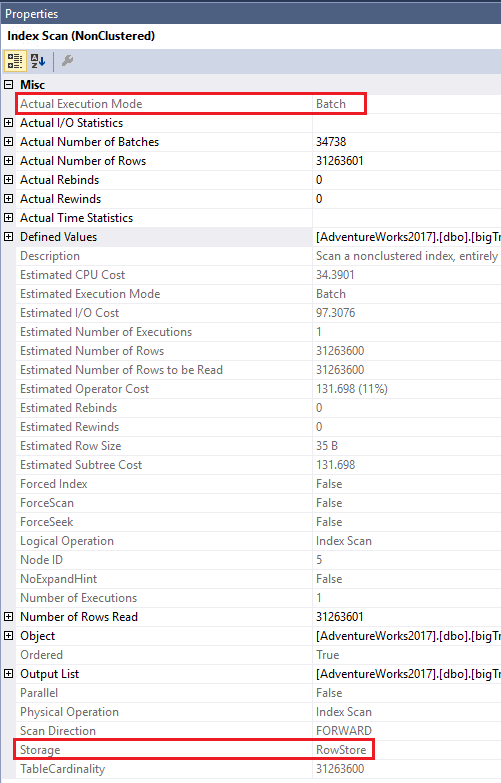 If you are using a monitoring tool, such as Redgate’s SQL Monitor, you can see the performance history of your queries and whenever the execution plans change. 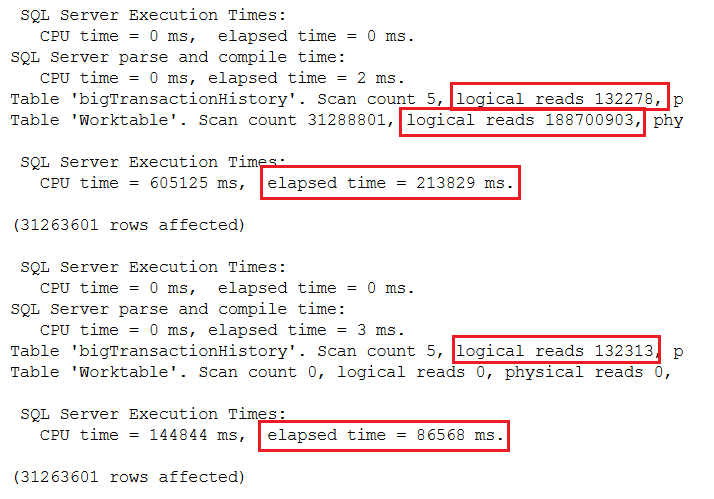 Wouldn’t it be a nice surprise if a query suddenly started running 5 or 10 times more quickly as the data grew? Many organizations are not going to upgrade every time there is a new version of SQL Server available. When they do upgrade, they often skip versions. The Big Data Clusters feature is getting a lot of publicity, but not every shop will need it. I think everyone is going to appreciate the new query optimizations. Batch mode on rowstore is just one of many great features that will improve performance by just upgrading to 2019 when it’s generally available. Today we are happy to announce our January update of Power BI Report Server! This release has many highly anticipated features such as copy and pasting between pbix files, expand & collapse on matrix row header, and row-level security support. Read on to learn more about these and many other new capabilities we’ve added in this release. This release includes support for one of the most highly requested features for Power BI Report Server – support for Row-level security in Power BI reports. The feature works in a similar fashion to how it does in the Power BI service. Report authors can set up roles in Power BI Desktop and assign users or groups to those roles in the Power BI Report Server portal once they’ve published the report. Unlike the Power BI service, however, users may not view content in a report until they have been assigned a role in Power BI Report Server. We encourage you to read the supporting documentation to learn more about the feature in Power BI Report Server. We have a substantial update to our scatter chart in this release. You can now use categorical fields on the x-axis of your scatter chart, allowing you to create dot plots. You don’t need to do anything special to enable this feature. Just add your categorical field to the x-axis and remove anything you may have in the Details bucket. You can this in combination with all of our formatting features, and of course it works with drilling on the x-axis. Let us know what you think and if there is anything you’d like to see added to this new visual layout! We’ve heard from many of you that you need to copy data out of Power BI into other applications like Dynamics CRM, Excel, and even other Power BI reports. Our first feature related to this is the ability to copy a specific value or a selection of data from a table or matrix. You’ll be able to find both of these options on the right-click menu. Copy value will add the unformatted value to your clipboard, and from there you can paste it wherever you want. For example, copy value from this cell in my table will add 32130 to my clipboard. Copy selection on the other hand will add a tabular version of all data currently selected in your table or matrix to the clipboard, including the row and column headers. The data will retain the data formatting that has been applied and subtotals are excluded. This option is very useful if you want to reuse a selection of data in another report in Excel for some quick calculations. … I’ll get all this data in a tabular format when pasting into Excel. … Will add the following to your clipboard. In summer 2018, the Power BI Desktop team had several great interns who worked on some exciting features. The first of these intern projects to ship in the Power BI Desktop is a themes gallery in the Desktop that lets you pick between several built-in report themes. You’ll be able to see these new theme options under the Switch Theme button in the Home ribbon tab. In addition to the default theme, you can now pick between 7 new options. All you need to do is pick the theme of your choice and it will automatically apply its color palette to all your visuals using the default color palette. There is now also a quick link the theme gallery on our community site if you want to try out a theme built by our great community! This project was done by our intern Chelsie Eiden, thank you Chelsie for your great work! We’ve had search in our slicers since our June 2016 update, and now with this update, we’ve added it into our basic filter cards as well. This functionality is much loved and used in our slicers, and we think this is a welcomed update to our filters as well. We are very excited to announce the release of one of the most requested visual features, the ability to expand and collapse individual row headers. There are two ways you can expand row headers. The first is through the right-click menu. You’ll see options to expand the specific row header you clicked on, the entire level or everything down to the very last level of the hierarchy. You have similar options for collapsing row headers as well. You can also add +/- buttons to the row headers through the formatting pane under the row headers card. By default, the icons will match the formatting of the row header, but you can customize the icons’ color and size separately if you want. Once the icons are turned on, they work similarly to the icons from PivotTables in Excel.